We are both tea people. It probably is hereditary, considering that our mom has two full drawers in our kitchen filled with tea (and this is after she cut down her supply quite a bit! ), a shelf of unique tea pots she has collected, and a collection of pretty tea cups. In my opinion, there is no better way to solve a bad day than enjoying a hot honey-sweetened cup of tea and a good book, and it is also the perfect cure when you have a cold. All of that aside, we recently were shopping at our favorite store (Williams- Sonoma, of course. So normal!) and we found espresso powder, something that we had been planning on buying for a while. We forked over $11 for a measly 3 ounces and promptly went home to start baking. 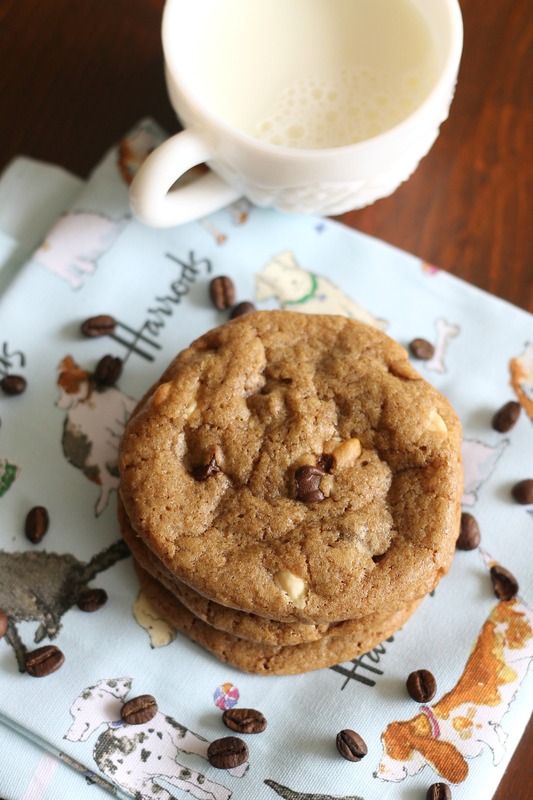 Since a lot of recipes on our to-try list involving espresso powder (like espresso cheesecake brownies and pumpkin spice latte cupcakes) called for ingredients we didn’t have on hand, we decided to simply make chocolate chip cookies and add espresso powder and white chocolate to the dough. These cookies are delicious. They have a nice amount of coffee flavor- not overwhelming, but still present- and the white chocolate is a nice touch. 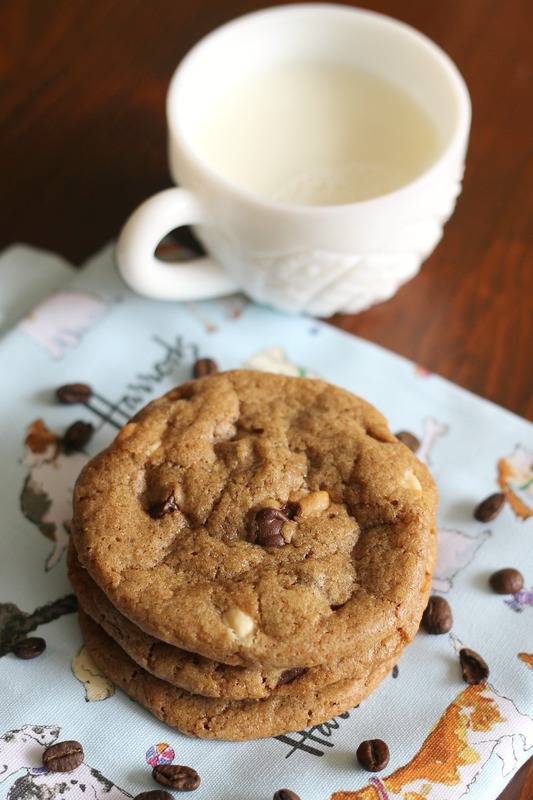 We used our favorite chocolate chip cookie recipe which turns out perfectly chewy and delicious cookies every time. You should try them! Preheat oven 325°. Whisk together dry ingredients together in a medium bowl and set aside. Beat together butter and sugars until well-combined. Beat in egg, yolk, and vanilla. Add dry ingredients and beat on low speed just until combined. Stir in both kinds of chocolate chips. Roll a scant half-cup of dough into a ball place dough onto cookie sheet, leaving plenty of room between each ball (or, make your cookies about 2 tablespoons of dough or so for smaller cookies). Bake, reversing position of cookie sheets halfway through baking, until cookies are light golden brown and outer edges start to harden yet centers are still soft, about 12 minutes. Do not overbake. Cool cookies on sheets until able to lift without breaking. Transfer to a wire rack to cool. Enjoy!